COMETS, eclipses and meteor showers all spelled some kind of heavenly portent to our ancestors, be they annually-anticipated Leonid and Perseid showers or, more ominous, a succession of lunar and solar eclipses. The thrice-repeated Great Conjunction of Jupiter and Saturn in Pisces in 6 B.C. is well known as the presaging ‘star of Bethlehem’. These two great planets became conjunct in 1980 and made a second appearance in April 2002, along with a myriad heavenly companions forming a line in our evening sky. A third return is yet to come (2009). Already this year we have had two comet visitors – Utsunomiya at equinox and Ikeya Zhang, accompanied by the Pi Puppid shower for good measure, in time for Beltaine. If we were still of superstitious bent, might we not see the celestial portents in the same way as our ancestors viewed such displays: a changing of the old order; a birth of the new? ‘A comet and many signs appeared in the sky’ in AD596 foretelling the deaths of Columba and Pope Gregory, according to the Annals of Ulster. In 734 another comet, ‘a great dragon’ seen in autumn, followed by thunder and a lunar eclipse on new year’s day 735, is said to have foretold the death of Bede. Charlemagne’s passing in 814 was marked by a total solar eclipse. Medieval famines and plagues were invariably associated with comets and eclipses. ALL FOGS are invited to attend our 2002 AGM on Sunday July 21 at 2p.m. at Midmar Kirk – carpark at kirkyard gate, map ref. NJ 699 065, approximately three miles West of Echt and within a rich prehistoric and early-historic landscape. We have never had an official dowsing day and so it is a bonus that Peter Donaldson and Phyllis Goodall have offered a ‘divining masterclass’ for members and guests with or without dowsing knowledge or experience. AGM business will be brief, so that the dowsing may begin immediately afterwards. 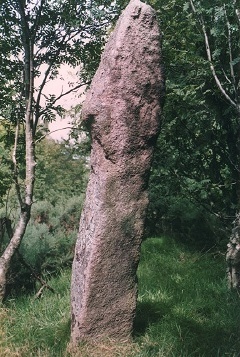 Midmar Kirk is, as many know, home to spectacular recumbent and flankers of a damaged stone circle, with a lesser-known outlying monolith a short distance north at Balblair. We have kindly been permitted to pitch a marquee at Balblair, but suggest you park at the kirk gate for convenience. Phyllis & Peter already have their own theories about this special landscape, but all will be revealed on the day. Bring a picnic or your own refreshment and be prepared to have your senses opened. There is already a good set of circumstances to relate Midmar/Balblair to tree-girt Sunhoney stone circle, just one mile distant, and an avenue linking the sites has been detected. The remains of early historic ancestor to Ballogie (Midmar) Castle lie to the South on the Cunninghar motte, with tiny St. Nidan’s church nearby. Sightlines include Iron Age Barmekin of Echt and midsummer moonrise point Blackyduds of Hill of Fare, and more. This special opportunity is free to all FOGS, and guests are asked to contribute £3 to our ‘charity events’ box, but any guest wishing to join FOGS (annual membership £10 now due) is warmly welcome. American initiative, the ‘Prophets Conference’ is an annual gathering of visionaries, sacred practitioners and speakers and authorities on ancient sites world-wide. This year it will hold its 16th congress at the famous debating chamber in Oxford Union – the first gathering in Europe – August 9th-11th 2002, with wrap-around dates of visits to nearby ancient sites Avebury, Rollright and Stonehenge [August 7, 8, 12]. In addition to a wide range of international speakers from various sacred traditions, the pilgrimages to local sacred sites will be conducted by author Paul Devereux with Templar historian Karen Ralls. Details and booking available on their website. IN previous newsletters we have tried to keep you informed on developments surrounding the 9thC Dupplin Cross which formerly stood as guardian over the ancient Pictish capital of Forteviot in Strathearn. Taken to Edinburgh in 1998 for ‘conservation purposes’ [Historic Scotland], it appeared at the opening of the new Museum of Scotland as centrepiece for its ‘medieval’ collection. Now in March 2002, after some negotiation by local parishioners, it has been returned to Strathearn, not to its hillside position, but installed inside nearby St. Serf’s Church, Dunning. St.Serf’s is a late 12thC church with original tower, on a 9thC Céli Dé (culdee) monastic site, rooted in the tradition of its founder Serf, who is notoriously hard to date, but probably 6thC. In Aberdeenshire, Serf is associated with pre-Reformation chapels at Monkeigie (Keith Hall) and Colpy and is known as the mentor of Mungo (Kentigern) who, in addition to having a cell at Kinnoir, Huntly, was subsequently bishop of Glasgow, where he died in 612. St.Serf‘s church at Dunning has a venerable tradition and, while we hope Historic Scotland will eventually place a plaque or other reminder of Dupplin‘s past on the Forteviot hillside, its new home is nothing if not welcome and local residents, aware of their heritage, are grateful at least for an appropriate reminder. The great cross, inscribed with the name of its patron, king Custantin (d.820), founder of Dunkeld, is itself a masterpiece of 9thC Pictish craftsmanship. Its new setting is framed by an 11thC carved stone arch which supports the 12thC square tower. While two centuries separate the schools of carving , the soft lines of the arch somehow enhance the cross, carefully lit to advantage. Dunning can be proud. MIDSUMMER was chosen by RCAHMS as time to unveil its new map service ‘CANMAP’- a revelation within its rather cumbersome database Canmore where searchers may access online maps of any chosen area in Scotland. A first over the rest of Great Britain. Shamanism ed. Neil Price ISBN 0-415 25255-5 a new compilation of essays: which succeeds in relating a prehistoric view of the world to modern magic. Alba: Gaelic kingdom of Scotland AD800-1124 by Stephen Driscoll ISBN 1-84158 145-3 insight into the transitional kingdom co-ruled by Picts and Scots.